People on these schemes often get no expenses. They have to work between 2 months and 6 months, and in some cases two years. Department of Work and Pensions (DWP) minister Chris Grayling has indicated that the two-year referrals will ‘loop’, meaning claimants could be on the programme indefinitely. Section 71 of the Coroners and Justice Act 2009, and its counterpart in Scots Law, Section 47 of the Criminal Justice and Licensing (Scotland)Act 2010, both outlaw forced or compulsory labour. I am fed up of people in work treating all those out of work as if it is THEIR fault they are out of work. Or that they are too lazy to find jobs. The truth is, there aren’t enough jobs. In some areas there are 50 people going after 1 job, yet unemployment is being identified as a personal failing. Some people have been threatened with sanctions for applying for TOO many jobs, and being sent to paint walls or sweeping the streets – as punishment. Just because someone is unemployed doesn’t put them in to the work shy category. 3million unemployed, 500,000 vacancies. This isn’t even being targeted at those who have never worked or have been out of work so long. People are getting misused and asked to do things that they don’t even ask payed workers to do. Equipment? no. Workfare Workers don’t get any equipment, protection, clothing or training. I’m not a do gooder, but ‘looking for work’ WAS the work once. These placements will do very little for anyones CV. This costs companies ZERO. Profit: there are quite a few providers making a tidy sum out of the other work placement scheme. THey are being PAID to run it. Atos, Reed, A4e etc. To do a few hours a week would be reasonable, not a FULL job for a quarter of the wage and no protection. And training, not work. This is what is happening: If you lose your job due to the cuts and have to claim Jobseekers Allowance then you may be sent to do workfare. 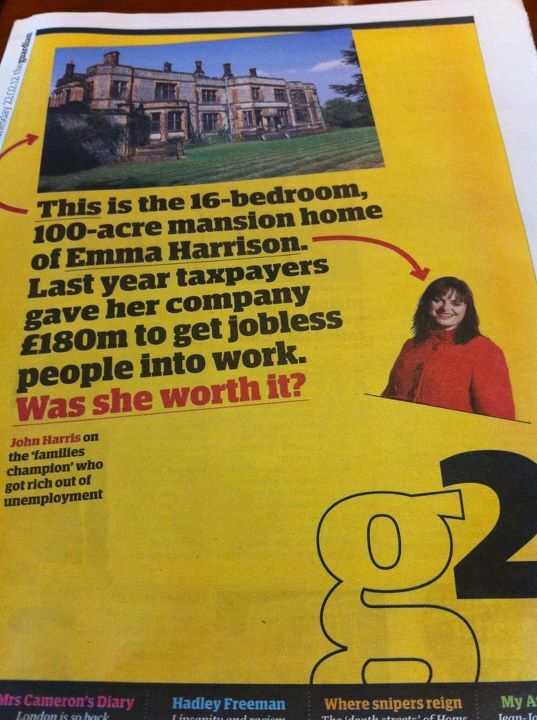 You could be forced to work unpaid for the likes of Asda and Tesco. You could even find yourself doing your old job – for no wages! Workfare erodes everybody’s pay, working rights and working conditions. Last year, 800 station staff on London Underground were cut, prompting concerns for passenger safety. Just months later, a new workfare initiative was rolled out by A4E (one of the Work Programme providers) to provide 200 workfare wardens. We have had a welfare state, and right to welfare as a universal right. That is being eroded. On the whole the ‘work shy’ people so often use as the reason for draconian measures, are very hard to identify except for the few massive blatant cases. They are THE FEW. People face destitution if they are ‘sanctioned’ for not taking part. Are we really saying that we will accept state sanctioned destitution on anyone? The companies such as Reed, Atos, a4e etc who are implementing these schemes are getting very healthy payments from the tax payer. Who is arbiter of the relationship between big business, the state and the citizen, and where are the democratic checks and balances? Since claimants are now the responsibility of private companies, there is not even the basic accountability afforded by the Freedom of Information Act. I personally know a fifty-six year old man who worked at Tesco for 40 hrs a week for 6 weeks for no pay. He said he was given the worst job, constantly filling freezers in the hope he would be taken on. After the 6 weeks were up the manager asked him if he would like to stay on for some extra weeks, my friend asked “with pay”? The manager said why would he pay him when he can pick the phone up and get more unemployed people who have to work for nothing of face sanctions meaning loss of ALL benefits for up to three years. Busy time, more paying customers, more profit coz they dont have to pay Christmas staff. THIS IS WRONG. Clegg says its voluntary here, http://www.bbc.co.uk/news/uk-politics-17116473 If you think that this scheme is not compulsory, have a look at this freedom of information request: http://www.whatdotheyknow.com/request/mandatory_work_under_the_work_pr which confirms that claimants could be forced to take up an unpaid work placement for six months – far longer than the two month workfare scheme which has hit the headlines. and Chris Grayling was on Radio 4 again saying “it is a voluntary scheme”. BUT if you are ‘referred’ it becomes mandatory! While people are on this, they can’t look for work. And while companies are using free labour, they are not creating jobs.